This course provides 12 hours of approved CE (continuing education on the Elevator Code and Elevator Technology, fulfilling that portion of the renewal requirements for both Master and Journeyman Elevator Constructors. 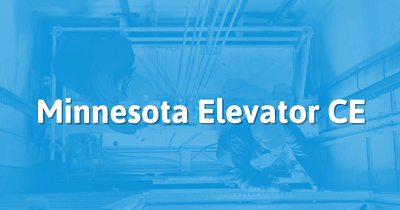 The course is a well-rounded survey of the key codes, standards, requirements, rules & regulations, and technologies that apply to elevator constructors in Minnesota. It begins with a class on the changes made from 2008 to 2010 to the critically important Standard ASME A17.1-2010, the Safety Code for Elevators and Escalators. The next classes discuss every Minnesota amendment, key rules, vital requirements from A17.1-2010 not covered in the Changes.